**NOT COMPATIBLE WITH NIKON D800 Camera (See Note Below). IMPORTANT NOTE: The Nikon D800 Camera's firmware currently only supports 32GB Compact Flash Cards manufactured by Sandisk or Lexar. The product is used in a Canon 7D to capture video and picture files. It appears that it is fast enough for high res video capture. It works fine for any use in the 7D. I'm perfectly satisfied with the card. The card, combined with a cheap adapter gotten elsewhere, is working like gangbusters on an old iPod I'd replaced a few years ago when the hard drive broke. Now I have more capacity, no fragile moving parts, and a sturdy music player, freeing my Touch for other things. I've got cards from Ridata, Kingston, Lexar, Sandisk, and more. The quality of the photos on this card are the same. Why is that? CF is CF. There are only so many NAND manufacturers out there and many of these cards are the same, but with different skin. I don't know who their supplier is, but it works just as good as my others. Sure the label is boring and the packaging is nothing to write home about (no packaging really..which is actually a plus in my book). It just works. Very fast in camera and in the computer. I upgraded cameras recently and that forced me to upgrade my extensive SD inventory to compact flash; not an inexpensive proposition. I came across the Komputerbay card via Amazon search and decided it was worth a shot. I tested it during Speedway Motorcycle practice at Pirate Speedway and found it to perform as well as, if not better, than my Transcend card. I primarily shoot racing, usually dirt tracks and at night, so I can't speak of its performance shooting landscapes or flowers. Good CF card, great price! Review by Gyz "Ig"
Good Storage Drive Review by Kalela K "Kawika"
I bought it along with a CF to 50 Pin IDE adapter (B004FCY7WQ ) to replace my iPod 4G's dead hard disk. I this "surgery" 3 days ago, and so far so good. Even though this brand was completely unknow to me, I decided to buy it because it was cheaper and other reviewers said it was as good as other brands, so I took the risk. Before recommending, I'll test it for some days, using my iPod intensively. For now, I'll give it 4 stars (for its very good price and it's working fine). If it passes the test of time, I'll go back here to give it 5 stars. Brought my iPod back to life. Review by Andy B. "ask me about my dog"
It seems to work well enough and the price was right. I did try testing it in a PC Card slot adapter that I have and it definitely didn't make the rated speed, but it does work in my iPod photo (with an adaptor: Micro SATA Cables - CF to 50 Pin 1.8 IDE Adapter with Case), letting me extend its life after its HDD died. Works great Review by Mark P "Mark P"
Great product. Cheap price. Product was not as fast as I anticipated, but I cannot complain because the price was so great! New life for old iPods Review by Mike "mike463"
I used this CF card to convert my 5th Gen 30GB iPod to a solid state drive. It works. And I got an extra 2GB of storage to boot. How do you do it? I won't go into the nuts and bolts here ...there's plenty of info on line ...but you do have to "lift the hood" on your iPod to make it happen. If you've done your own battery then you should be capable of doing the conversion. The price point on these CF cards is finally coming down and the Komputerbay card is about the cheapest out there. Not always a good thing 'cause you do get what you pay for sometimes but so far mine's working just fine. Only time will tell as to it's true longevity. To make the conversion you'll need to score the adapter listed on the Sellers page ...down there where the "combos" are listed ... but for less than $40 you can bring back your iPod from the dead and dying category. And, with replacement hard drives for these classic iPods in the $60 plus category, this is a deal. A *big* benefit of the conversion is battery life. The battery no longer has to power a mechanical hard drive (which is essentially a small electric motor). With the conversion you seriously reduce the power draw on the battery. Even the lame capacity battery Apple put in these iPods when new can power this conversion for what seems like forever. You also save weight. A converted 5th Gen iPod is lighter ...you can feel it. And the CF card is able to withstand significantly rougher handling than the old hard drive ever could. The card is supposedly faster but I can't totally attest to that. It doesn't seem to make much difference in start up time that I can notice. works Review by RealPro "Love Unix"
Works as make-shift SSD Review by New San Diego Dad "WJ"
Not bad! Review by Ali H. Zaidi "zeegator"
It is a new product for me. I like the capacity and the speed. Started to use it a few days ago and it seems to perform just fine. we should try and support new products provided they're of good quality and not always rely on big brand names. Used this product to replace the hard drive in my iPod classic, this compact flash unit was on a list of compatibles recommended by the purveyor of the interface card. To date all is well, the ol' iPod likes it and is actually a little more responsive in performance. So far so good! Review by Nicola M. "Nicola"
I've been using this for a bit now and have had no issues with them. Best quality/price ratio on CF cards!, Review by Nicola Salvatorini "T3kn0kr4z33"
Price is right and very performant Review by Jon Dufour "Jon"
I bought this CF card for my Nikon D300. I have more SD cards for my other cameras, but this is my first CF. I was looking for a great card, but I didn't want to spend $70.00 or $100.00 in a card (My used D300 cost me $415.00). Then I found this 32 GB CF card for $28.99. This is not the fastest card that you could buy (800X 1000X) but 266X is more than enough to me, and I had no problems with this card so far. Fast and Relible Review by Amazon Customer "Dog<3er"
This low cost card works in my Nikon D700. I haven't done speed tests against other, more expensive, cards, but have taken a large number of images with no issues. I was able to fire off multiple bursts of images with no problems. This probably has much to do with the buffer in the camera, but everything was captured as expected. I normally shoot RAW+jpeg. Admittedly, the Nikon D700 doesn't begin to produce file sizes approaching DSLRs of a more recent vintage, so experiences may differ for those who just got one of the leaders in the megapixel wars, but this card has been sufficient for my work. 1. I tested it extensively at home, with video, and I was able to get it to record to the max recording size on the 7D (4GB). This continues to be an issue with the Kingston CF I have, and I lost a few videos during my vacation (Err 02 - requires a hard reboot of the camera to recover). 2. much cheaper than the SanDisks. I'm glad someone is still catering to us old gen folks. I've been through 2 of these cards in one month. The first one lasted about 2 1/2 weeks. Then it all of the sudden was not longer readable in any camera, card reader, and tested on multiple computers to see if I could get it read- it just refused to show up. So it was totally dead. I got a return, and went out on a limb and got the same thing, hoping it was just a fluke because even on high end name brand cards there are defective units. My second card lasted 5 days- same exact thing happened. The Komputerbay memory card was ordered for my Canon XTi camera. The card slipped into the memory card slot easily, and when formatted in the camera it formatted properly. I have taken a number of photos and downloaded them with no problems. The card appears to be of high quality and is doing the job I bought it for. All photos that were taken and stored on the card have been moved to my computer without loss of data or quality. I am satisfied with the quality of the card, the delivery time was acceptable and it was packed properly. I used this product to replace the HD in my 15GB 3rd gen iPod. I wanted to remove the HD and use solid state hardware, since it's hot in Las Vegas, and I leave my old 3rd gen iPod in the glove box. Works like a champ! It takes a few hours to transfer 15GB of music, but I set it up to update, and leave it for a couple of hours. Might be a little slower than the original HD for transferring songs in, but the jumping between songs is instant! Very happy with the product. Great card for the money. I'm using it on my Canon 5D. I don't know how it would work on a camera with faster capabilities, and/or with video, like the 5DII or 5DIII or any of the newer Rebels or 7D or 60/70D, but for my older 5D, the card is just great. Make sure you have the latest firmware 1.1.1 if you have the 5d in order to use these higher capacity CF cards. Time will tell as to the long term reliability of the card, but I suspect it work just fine. 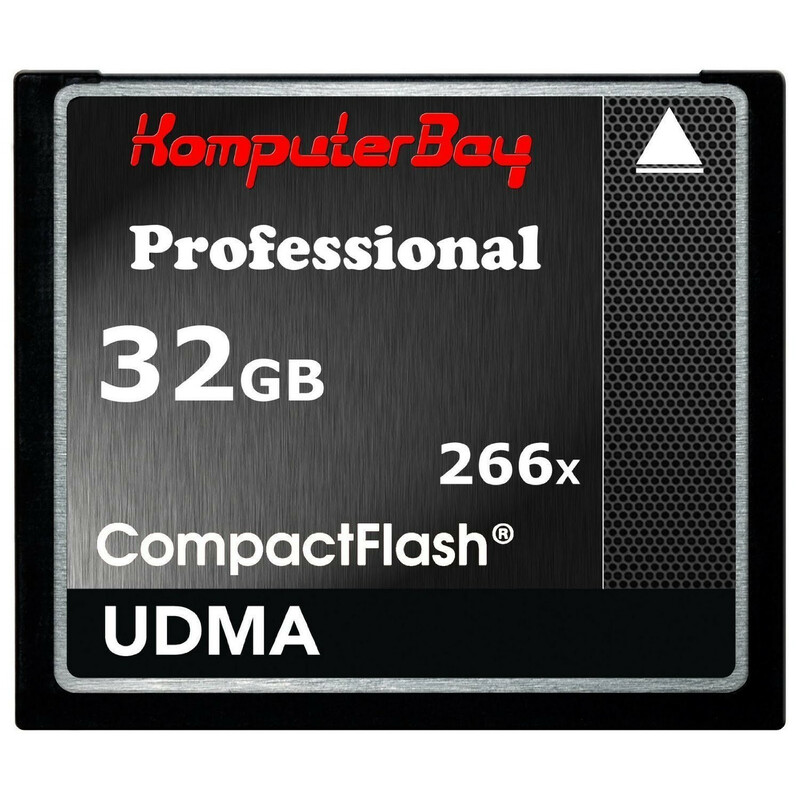 I hesitated a little before purchasing, as I've never heard of Komputer Bay, but I took the chance based on the significantly lower cost than similar offerings from Transcend and Sandisk. Admittedly, most of the more familiar branded CF cards sport higher speeds, and that may the reason for their higher cost, but I just take pictures, and for my needs this card is just fine. I like this can very much Review by Chrissy M. Strawn "Mistress Cayenne"
Works great! Review by Amazon Customer "kbreak"
...I purchased this thinking it would be the replacement for a disk drive in my laptop/note book. Win XP/7 will not recognize these as a non-removable disk. You'd have to get in and modify one of the pins for this to be recognized as non-removable. Don't make the same mistake I did. They make great aux SSDDs but not promary disks. I really got this because of the price, speed for my use is not an issue, reading music from a CF doesn't require much speed. I used a CF to 1.8" CD converter to update an old iPod 4th generation click wheel from hard disk to solid state. It increased the storage space from 20 GB to 32 GB, and operates much faster and the battery lasts longer. I was also surprised that the iPod did sync all my music to the device much faster then when it had a hard drive. I did not do a real speed test, but it seemed 150% to 200% faster. So I'm not using it in a camera of video recorder, but I would say the speed is as advertised. Edit: I just performed photo recovery on this corrupted card and found that there were photos on the card from someone's wedding. Komputerbay sold me a used card as new! They didn't even perform a proper wipe of the card, as the old photos were still recoverable. I'll also add that while using this card, it couldn't properly handle writes at the speed the camera tried to save photos. If I took shots on burst mode (more than 2 photos a second), most of the files would be corrupted, with my camera display telling me that the photo file was invalid. Edit 2: Their standard refund policy has a 15% restocking fee. I asked if they would waive it, seeing as they sent me a used card. Komputerbay offered to do that with the stipulation that I remove my review. I declined. Corrupted after 10 files Review by annstarrr "Ann"
I purchased this card primarily for an older Nikon DSLR camera (D-70S), and it works beautifully. I can now take (an almost comical) 5,700 photos with this one card alone. I have noticed no limitations on speed of photo taking or reading on this camera, but I have not tried it on a newer device, so I cannot vouch for how it would perform with a HD video camera or other devices that require much faster read and write speeds.